A selection of Bug soaps which will make anyone smile. All handmade and palm oil free. A selection of Bug soaps which will make anyone smile. They are an ideal gift for boys, girls or adults with a sense of humour. They would make a great gift idea for a birthday ‘goodie’ bags, Bridal Shower Bags, Wedding Favours or even as a gift to someone to simply show that you care! The scents and colour of all insects are varied and based on availability. If you have a specific request please message me and I will see what I can do! These soap insects can be purchased singly or in a set of 4. P&P will be applied to large custom orders and will be determined by the weight of the final product. This will of course be discussed and agreed before the final order is made. All soaps at Soap & Pamper are handmade by myself in Plymouth UK using ingredients that are 100% natural, palm oil free and vegan friendly. I use the traditional cold process method and simple ingredients of Olive Oil, Coconut Oil, Cocoa Butter, Shea Butter & Castor Oil to create a beautiful bar that lathers up well and leaves your skin feeling soft and refreshed. As the colours are natural please expect the colours to vary – the quality of the soap and the scent however, will always be the same!! 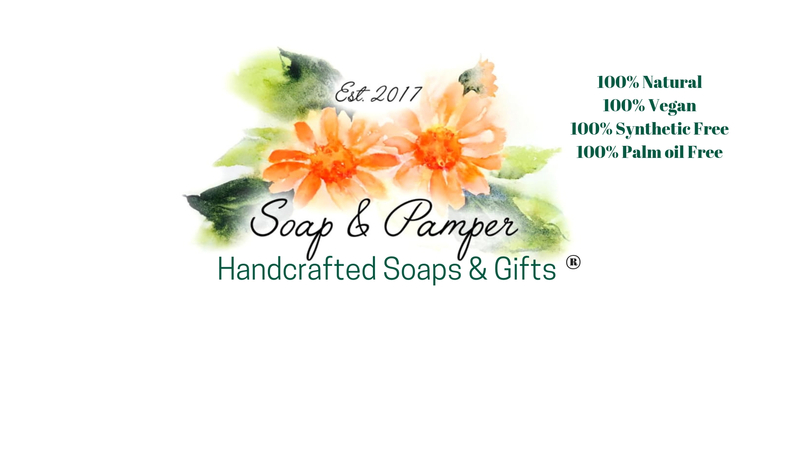 Soap & Pamper is an environmentally friendly business with ingredients sourced as locally as possible. In addition, recycled packaging is used wherever possible to individually wrap the soaps and to post them.